Not because it's a family tradition or that we live somewhere that requires huge stocks of food for the winter. I taught myself and we live in Florida. There are only a few weeks a year that are too chilly to wear flip flops to the grocery store. into beautiful preserves, pie filling or like I did today, strawberry lemonade concentrate. We don't drink alot of sweetened juice so I decided to cut the recipe by half. I think this would be a good starting project for anyone wanting to try out their canning skills. 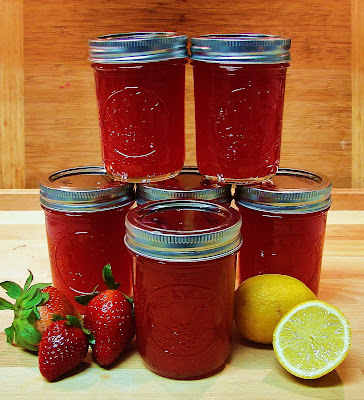 With only 3 ingredients and no pectin required, it's the easiest one I've seen. First gather your ingredients. You will need strawberries, lemons and sugar. Heat your jars and lids in simmering (not boiling water) to steralize them. I put mine on a clean dishtowel until I'm ready for them. Now squeeze enough lemons until you have 2 cups of juice. Wash your strawberries and remove their tops. Place 3 cups of strawberries in your blender. ﻿Blend until nice and smooth. Pour your liquid stawberries into a large pot. Add your lemon juice and 3 cups of sugar. Turn on the heat and stir. Continue on medium-high until your mixture reaches 190 degrees. Remove from the stove and skim the foam off the top with a large spoon. I put my foam directly into a cup for a taste test. Now it's time to ladel your concentrate into jars. Because I made 1/2 a recipe, I used 6 half pint jars. Covering your work area with a piece of foil will make any sugary liquid that might spill much easier to clean up. Fill your jars until the liquid is about 1/4 inch from the top. ﻿Wipe any liquid off the rim of the jar and place a lid on top. Add a band and turn until finger tight. Fill and seal the rest of your jars and put your utensils and pot in hot soapy water. This will make clean up easier. Add a clean towel to your pot of boiling water. This will cushion your jars and help prevent breakage. Place all your jars into the pot and process (boil) for 15 minutes. Remove your jars and place on the counter. You should hear them make a hissing noise and maybe a pop. This means that they are sealing properly. You should not be able to press the the tops down. Don't worry if one doesn't seal, it can be the first one you use. Just put it in the refrigerator.